Today I would like to describe the events that take place when a company chooses to surface mine coal from under the earth. Of all aspects of mining this is, perhaps, the most controversial, in part because of the large surface disruption that often occurs during the time that it is happening. This post will try, however, to just describe the process, without using any of the emotive words that usually surround this topic. For those wondering what this is, on many weekends I post a small technical talk, which tries in a relatively simple way to explain some aspect of fossil energy extraction. I will direct you to earlier talks at the bottom end of this one. For those that are more knowledgeable I recognize that I am often simplifying considerably, however, by knowing some of the basics it may be possible to achieve a better understanding. This becomes particularly true when one talks about coal mining, since there is often discussion on these pages about the relative investments in energy in a process, relative to the amount of energy recovered. Part of that evaluation involves the nature and structure of coal as it is mined and treated, and I will go into more depth on that subject next time. It is relevant here, since it is one of the bases of judgment as to how a seam of coal is mined. If you remember, I had suggested that you might think that coal is found as being similar to a layer of cream in a cake. Separated by the layer of rock above, and more rock below, the coal itself is a relatively even thickness of material that can stretch for miles. However you should note the word "relatively" in that description, and look at the rock layers in a road cut the next time that you drive through one. You will see variations in the layer at the top and bottom all along the length. Also the layers do not have to be flat, geological movements may have tilted the seams until they are at angles all the way up to vertical. (The coal is the Urals is often highly angled, as are some of the seams in Washington State). Coal bed thicknesses can vary from the thick seams found in Wyoming, for example, which can be more than 200 ft thick, to thin stringers of coal that are only a fraction of an inch high. When the coal lies near the surface, it is this relative thickness of the coal, to the thickness of the rock above it to the surface, that decides whether it is going to be economic to mine at all, and if it is economic whether to remove the rock from over the coal to get it out (hence the strip of strip mining) or whether the coal is better mined from underground. (The name also comes because you work on one strip of land at a time, as you remove the coal sequentially across the property). This relative ratio, the stripping ratio, varies with the quality of the coal, and other operational costs. For example a coal seam that was 100 ft underground, and some 6 ft thick, would have a stripping ratio of around 16.7, and there was a time that that would have been about the economic limit. But as the price of coal increases, and earth-moving equipment gets more efficient, that ratio may increase. So what is involved in strip mining (apart from all the permits, surveys etc that make the whole process of installing a mine take a number of years)? The first step is to remove the top soil, and that which lies under it, as either one or two separate lifts. Generally these are scrapped from the surface using specially designed equipment. Depending on the final size of the mine, the soils are then stored until needed, or carried to the part of the mine that has already been worked and, as a final step in restoring the land contour, the soil will be replaced and the appropriate ground cover planted. Once the top cover has been removed, the layers under it are usually rock, and this must be broken first, before it can be moved. The fracturing is usually done by drilling large (say 8-inch) diameter holes down through the rock, and then filling them about two-thirds full of an explosive. As a general rule you don't want to fill them all the way, since if you did, then when the explosive went off it would just shoot back out of the hole. The large columns of black smoke you see shooting from such blasts in movies are for effect. A skilled blaster will fire the entire round, and if you were to watch a slow-motion movie, the ground level would rise in a pattern, as the individual rows of charges went off, but there would be almost no gas vented from the holes. To confine the charge, the top part of each hole is filled with what is known as stemming, usually some of the rock particles that were removed from the hole during the drilling operation. I said that the explosive is fired in rows, and this is to make the explosive work more efficiently. When you "fire" an explosive you are causing the chemicals in the charge to very rapidly turn to gas. At the same time the blast wave from the start of the reaction will have cracked the rock immediately around the drilled hole. Thus as the explosive turns to gas, that gas can penetrate into the cracks around the hole, causing them to grow out into the solid. The gas follows the cracks, and helps them to grow, while, at the same time "lifting" the rock away from the solid as the gas penetrates. At the same time, firing the explosive in a sequence lowers the overall vibration directed into the ground. If the mine so chooses it may angle the holes that were drilled so that as this gas penetrates under pressure, it will also throw the rock some distance towards the area of the mine that has previously been worked. This is known as blast-casting and is not always needed. However by firing the rows of charges in sequence (using small delays set into the detonators that are connected together to set-off the individual charges) the rock nearest the edge of the last layer of rock removed is broken first. This removes some of the confinement of the next layer in (working the other way around to the increased strength from confinement that I mentioned in the Longwall section). In this fashion and with only millisecond level delays in each row, the entire rock in a strip overlying the coal can be fragmented. (Note that in the video I referenced, the dust is from the rock impact, not the blast). Once the rock is broken, then it is moved away from over the coal. There are two different machines that can be used for this, either a drag-line excavator, or a shovel. However the size of these machines may be somewhat larger than most folks imagine. Because of the large quantities of rock that have to be removed, there are usually economies of scale that mean that the larger the machine, the faster and more economic the removal is. With a drag-line, the machine usually sits on top of the rock, and will lower a bucket that is dragged up the free surface of the blasted rock, until it is full. The dragline then swings its boom, until it is over the strip of land where the last pass of the process had removed the coal, and dumps the rock into that space. By steadily working across the face and back down the area that was blasted, all the coal seam is exposed, and is ready for removal. At the same time, the previous strip of ground is filled back up to about the starting level of the ground. If the coal is relatively shallow, or the rock is being removed in several lifts, then a different machine can be used. This is called a shovel, though again, its bucket can often hold a large family size car. As with the excavator, the shovel scoops up the broken rock, swings around and dumps it in the cut behind the machine. Note that it is more economic for the rock to be moved only once, and so the width of the strip will be governed by the size of the machine that is used. And a shovel will often only remove rock layers of around 15 - 45 ft high, depending on machine size. After the coal has been exposed, then, depending on the strength and thickness, it can either be removed without any further process, or it may require some additional explosive fracturing to make it easier to pick up. It depends on the coal. In either case, when it is loose enough, the coal can be picked up by a smaller shovel, and this will usually load the coal into trucks, that will carry it away to the plant where it will be cleaned. At which point you may say, wait a minute, you have just dug a hole 100 ft deep, and have trucks being loaded with coal, but how do they get out? Good point! Generally during the creation of the spoil banks behind the working area, bulldozers will create a ramp that slopes down, from the surface, to the coal level, and this will be kept moving forward as the strip of ground that is being mined moves across the property. Once the coal has been taken out, then the space is available for the excavators and shovels to place the rock there, as the next strip of ground is worked. 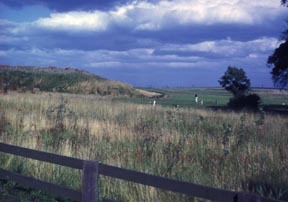 The initial appearance of the spoil banks is usually a series of large hummocks, prescribed by the movement of the earth-movers, but once the pass placing that rock is over, then the ground is restored to contour, generally using some form of bulldozer, though larger than those normally seen in public. After the ground contour has been restored, then the top soil is replaced, and the ground seeded, and brought back into production. Where, because of the shape of the original surface, that is not possible, then, before mining took place, an approved location for the excess rock will have been established and approved. That area will also, post-mining, be treated and brought up to a specified condition. Where the original shape of the land does not allow full restoration of contour, then, as in mountaintop mining. Note that there are a number of sites that have pictures that show that land has been returned to productive farm use after mining. In the spirit of the times, I thought I would show a different end use. Last year the subjects covered related to oilwell drilling, and, for convenience, I will post a collective list for this in a separate pose, hopefully also this weekend. As usual any concerns, corrections, or questions, should be addressed in comments. Great article,thxs! What huge equipment, especially that dragline. Is that powered by diesel, electricity, or can it feed itself coal directly? Usually electrical. For a photo story on how one was built at a site, visit here. I understand the Democrat Governor of Montana has been pushing this for the flat eastern part of his state that is economically dying. Strip mining does get an understandably bad rap when areas are not restored or in the process messed up, such as much of the mountain top mining in West Virginia that resulted in many filled in streams and eventual flooding. It seems to me that coal, because of GHGs, should be used primarily for synfuels. Synfuels will emit just as much at the point of use; they are going to emit more total GHG's than petroleum unless the waste from the liquefaction process is sequestered. I understand that the average gasoline-fuelled vehicle is 14.9% efficient, tank-to-wheels. The average electric vehicle is probably more like 70% wall-to-wheels, and an IGCC powerplant can be upwards of 40% efficient while producing about half its total carbon emissions from the syngas cleanup operation (where CO2 is easily co-captured and co-sequestered with H2S). The IGCC/EV could emit less than 40% as much CO2 as CTL+sequestration, and IGCC/EV+sequestration could cut that to 20%. Help me on this if you can. I understand this from the point of view of an intelligent layman on the topic. So I rely on what I read - i.e. secondary sources. I understood from a New York Times article on the Montana Governor and his goal of a large Syn-fuel production center in his state, and also the Pennsylvania project coming on line and with product sold out for ten years, that it burns producing less GHGs. If sequestering is the key, well, we could do that with regular coal fired plants too. If there is no savings between the two in either GHGs why mess with it, or is it because it is less pollution in the form of mercury, etc? I'd believe less pollution (F-T diesel can be made with almost no sulfur and almost no aromatics, which slashes SOx emissions, particulates and polycyclic aromatic hydrocarbon [PAH] emissions), but less GHG's? I find that really hard to swallow. You'd have to have less carbon in the fuel, or get greater thermal efficiency from the fuel in the same engines. I just don't see how this could be done. If sequestering is the key, well, we could do that with regular coal fired plants too. Not really. The CO2 in synfuels plants, and about half of the CO2 in oxygen-blown IGCC plants, is produced in a relatively pure stream at high pressure; this makes it cheap to separate and liquefy for disposal (co-capture and co-sequestration of H2S along with CO2 may be cheaper than splitting out the H2S). Trying to pull CO2 out of the exhaust gas of a boiler at atmospheric pressure and 70-odd percent nitrogen is far more expensive, both in equipment to handle the vastly greater volumes and in energy to separate the gases and compress the CO2. The clean coal process sold by GE gasifies the coal and uses it in a gas turbine to generate power. A coal fired plant uses boilers and steam turbines. You uses somewhat less coal for the same amount of generated power in that part of the process. However, some coal is converted to CO2 in the gasification part of the process, and overall you usually end up with more CO2 if you go the gasification route. The advantage to the synfuel route is after the gasification part of the process you have a stream that is a mixture of CO2 and H2. If you want you can separate the H2 from the stream and run the turbine on that. It's easier to do this than with a regular power plant exhaust because the volumes are much smaller. How about taking pity on us poor slobs with 1024 x 768 terminals. It's no fun using the scroll bar just to read a line of text. Sorry I did not see the problem, and was out all evening so only just caught it. LJR pointed out what the problem was, and hopefully I have fixed it. Thanks! I think your golf course picture forced the width. How does Stuart handle images? He usually has a small version I can click on if I want to see it full size in a separate window. With pictures, including of mining "scrip." One thing that struck me reading his diary...coal mining uses a hell of a lot of petroleum. Mining machines and vehicles that make anything else you've ever seen look like a toy. Blasting with diesel and ammonium nitrate. I saw some of the coal mining machines on a Discovery Channel documentary on "Mega-Machines." They are immense. According to the show, the reason for building these unbelievably huge, expensive machines is that the coal that is easily reached by human miners is now gone. Cheap ammonium nitrate explosive requires cheap natural gas. It could put a crimp in surface mining if it gets too expensive. If nitrate gets too expensive, there will always be charcoal + liquid oxygen. One useful property is that a "dud" becomes inert after the LOX has evaporated. I don't see charcoal or coke becoming costly as long as coal is still being mined. Mostly the coal companies are using bigger machines is because "bigger is better", at least in mining. By using a larger piece of equipment you end up getting a lower unit mining cost in $/ton of coal. I used to work in the coal mines in Wyoming and would tend to agree with the article you posted from DailyKos. The author is exactly right in the way mining companies operate. significantly impacted by peak oil. are going to be much worse post-peak. are simply shifted to another place. the carbon dioxide is released. to the total pollution of the planet. CaO + H2O > Ca(OH)2 again. There's "clean" coal and then there's clean coal. The syngas in an IGCC plant can be cheaply scrubbed of 99% of its mercury using activated carbon filters, and other heavy metals are probably removed even more easily. Further, the CO2 emissions are less than with atmospheric powdered-coal combustion even without sequestration, due to greater efficiency. You don't need a pipeline to the GoM if you have a spent gas well or old oilfield nearby. You know, like the ones in Pennsylvania (right next to Ohio), and stretching across Missouri through Texas? All those areas in California which are redeveloping their oil wells? We do have some fairly reasonable options, if we use them.